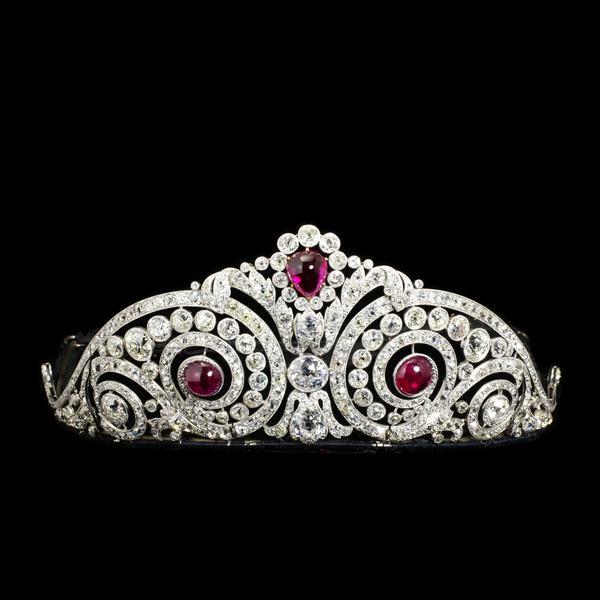 This diamond and synthetic ruby tiara was made in September 1913 by Cartier, Paris, for the marriage of Alexandra Comnène, an artist of Greek descent living in Italy, to Robert Everts, a Belgian diplomat. It was made largely from stones supplied by the bride. She first had the loose stones assessed in Naples, and then took them with her to Paris, where she stayed at the Hotel Régina and commissioned Cartier to make the tiara. On the invoice the tiara is described by Cartier as a 'bandeau', the cost of the mounting and the provision of a small number of extra diamonds charged at 4000 Francs. She wore the tiara at the civil wedding ceremony on 15 November 1913 in Brussels at the Mairie d'Ixelles. The insurance valuation of the tiara was 30,000 Francs. The tiara is in the garland style, in which diamond-set scrolls and scrolling foliage played a large part. Inspiration came from ornament books of the 17th and 18th centuries which were re-published in the second half of the 19th century, and from the study of the architecture and ironwork of Paris and the palaces of Versailles and Fontainebleau. 'Louis Cartier constantly encouraged his draughtsmen to wander through Paris with their sketch-books and to note down details of seventeenth and eighteenth-century architecture' (Hans Nadelhoffer, Cartier Jewelers Extraordinary, London, 1984, p. 48). The firm of Cartier was founded in Paris by Louis-François Cartier in Paris in 1847. The early years of the 20th century saw the creation of branches in London and New York, as the case for the tiara records, and the further development of a dazzling international clientele. The invoice for the tiara is headed by coats of arms recording the royal appointments granted to the firm by the King of England, the Emperor and Empress of Russia, the King and Queen of Spain, the King and Queen of Portugal, the King and Queen of Greece, and the King of Siam. The tiara was made by Cartier in Paris in September 1913 for the wedding of Alexandra Comnène. She was the daughter of Greek-born Angelia Calvocoressi (b. Constantinople 1840; d. Berlin 1929) and of her first husband Jean Michoglou. Alexandra was also the adopted daughter of Angelia's second husband, Waldemar Becker-Reuterskőld. Alexandra was married to Robert Everts (1875-1942), son of the Dutch Consul in Brussels, Philip Pelgrim Everts (b. Arnhem 1839; d. Brussels 1897). The tiara was worn at the civil wedding ceremony on 15 November 1913 in Brussels at the Mairie d’Ixelles. The tiara accompanied them in his diplomatic postings listed below, beginning with Peking. Examination of the tiara confirms that the weight of diamonds remains approximately 67.50 carats (as specified in the Cartier invoice in 1913). The tiara has a deep-green leather box stamped on the lid in gold with AC, for Alexandra Comnène, surmounted by a coronet, and on the base CARTIER (in gold) and MADE IN FRANCE, fitted internally and supplied with original twin-pronged screwdriver. The coronet refers to Alexandra's claim to descend from the Comnenus family, which had furnished emperors to Byzantium in the 11th and 12th centuries. A note in Italian dated Naples, 16 July 1913, on the back of headed paper from the Hotel Sirene, Sorrento, lists diamonds and their weight in old carats and fractions. Besides these weights have been added by another hand the equivalent weights in metric carats, presumably by Cartier in Paris, since there is a note in French that one small brilliant is lacking. Metric carats became the international standard in 1907 at the Fourth General Conference on Weights and Measures. Notification from Cartier, dated Paris, 10 September 1913, directed to Madame Alexandra Comnème [sic] and signed by Edmond Forêt, an eminent figure at Cartier for many years, stating that the list enclosed has details of the stones entrusted by her for remounting into the tiara (en Bandeau brilliants), and that the cost will be 4000 francs. An accompanying list of stones received from ‘Madame Alexandra Comnème / Naples’ [sic] is on Cartier headed paper, titled Etat des Pierres, dated Paris, 10 September 1913. It is signed by Edmond Forêt. The list comprises the loose stones listed in the Naples note, with the addition of stones dismounted from a ring. An invoice from Cartier on headed paper with six royal warrants covers three orders: the repair of a pendant, 4 September 1913, and the making of the tiara and a new pendant/aigrette, 22 September 1913. The price for the mounting of the tiara remained 4000 francs, as quoted, and the stones are detailed: three ‘rubis reconstitués’, 330 brilliant-cut diamonds weighing 66.49 carats, and 76 rose-cut diamonds weighing 0.85 carats, of which Cartier furnished 70 brilliant-cut diamonds weighing 2.92 carats and all the rose-cut diamonds as well as the mount. The total charge for three items includes an allowance made for the gold mounts of the jewellery broken up for the stones. A receipt slip for payment of the bill is dated 24 September 1913. Lloyds of London insurance policies and related correspondence. At first insurance was arranged to provide cover in Europe for Alexandra Comnène’s three principal jewels at a cost of £10 10s. In view of her husband’s posting in China, this was later extended to provide worldwide cover for a further premium of £2 2s. The documentation shows that the tiara was valued in October 1913 at 30,000 francs. An envelope inscribed ‘Comptes de Trousseau’ contains 22 bills for purchases made by Alexandra Comnène and her mother in September 1913. The establishments included the Grande Maison de Blanc, which supplied handkerchiefs embroidered with coronets, Rabeau, Marthe Maccagni, Chardet, Hellstern & Sons, Linker & Co., and S. Worms, maker of stones and pearls, which supplied one cabochon ‘ruby’, invoiced to Alexandra’s mother. 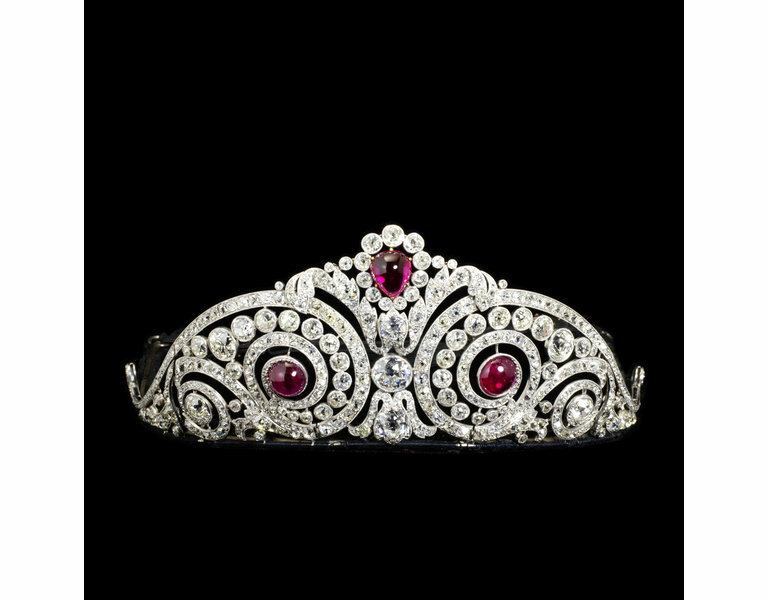 The tiara is a rare recorded example of the use of synthetic rubies by Cartier before the First World War. According to the invoice, they are not listed among the stones supplied by Cartier, so it appears that Alexandra selected and bought them for herself. As noted above, amongst the bills of the Paris purchases was one addressed to her mother for a single cabochon ‘ruby’ from a firm of pearl and stone manufacturers, S. Worms. The stones in the tiara show the characteristics of the stones made by a process developed by Auguste Verneuil. Cartier later made greater use of synthetic rubies, as reflected in Nancy Cunard’s recollection of a brooch given to her mother in the early 1920s as ‘a large diamond brooch set in platinum with a reconstructed ruby in the centre’ (Hugh Ford, ed., Nancy Cunard: Brave Poet, Indomitable Rebel, Chilton Book Company, 1968, cited in Anne Chisholm, Nancy Cunard, Sidgwick & Jackson, 1979, p. 22). Alexandra Comnène, whose mother was Angelia, née Calvocoressi, chose the family name Comnène. Alexandra was born in Corfu on 4 February 1880 and died in Brussels in 1961. Her husband, Robert Everts (born Brussels 12 September 1875, died Brussels 30 April 1942) was the son of the Dutch consul in Brussels. He adopted Belgian nationality in about 1898 and entered the Belgian Diplomatic Service, serving in Paris (1900-9), Mexico (1901-2), Bucharest (1902-6), Peking (1910-16, 1920-4), Berlin (1924-31), and Madrid (1932-9), after which he and his wife lived in Brussels. Together, they formed collections of Mexican armour and textiles, Puebla ceramics, Spanish colonial glass, Chinese textiles, ceramics, furniture, ceramics and metalwork, Chinese and Japanese lacquer, and they preserved lace which they had inherited. British Museum: Mexican textiles and beadwork (1994 AM.3.1, AM7.1-20; 1996 AM10.1-18; 1997 AM4.1). Mexico City, Franz Mayer Museum: Mexican rebosos and textiles (1994 AD-004, AD-020; DRA-0009, DRA-0025; AD-021 AD-030; DCH-0001 DCH-0010; AD-031 AD-038; DFB-007 DFB-0014). Ecclesiastical embroidered panels, 16th. century (2002 09157-01966; DCN-0013, FCF-0011-15; FPA-0013-16). Alexandra Comnène-Everts was herself a proficient artist and designer. Albums of her drawings of ornament on Chinese monuments (ca. 1919-1925) have been acquired by the British Library (1998 N Or.15493/1-6). Furniture, Textiles and Fashion Department, 20th century dress (T.12 to 17-2003); Belgian and Flemish lace (T.5 to T.10-2003; T.62 to 65-2008). Brisby, Claire. Angelia Calvocoressi 1840-1929: A Cosmopolitan Life. Journal of the Hellenic Diaspora , 30.2 (2004), 97-130. Brisby, Claire. Cartier's bridal tiara (1913) in the Jewellery Gallery, Victoria and Albert Museum. Jewellery History Today, 20 (Spring 2014), 3-5.